Hope Demi is out of stock has Retired. If you like a Miche Shell or any Miche Product please don't wait to see if they will go on sale because some sell out really, really fast. 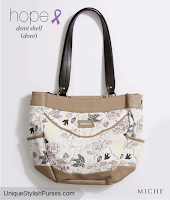 Feminine and delicate, the Hope (dove) for Demi Bags adds a sweet, inspiring touch to casual outfits.